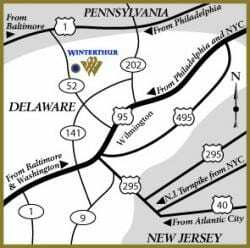 Nestled in the heart of Delaware’s beautiful Brandywine Valley, midway between New York City and Washington, D.C., Winterthur is located just minutes away from Longwood Gardens and other Brandywine Valley attractions, hotels, and restaurants—including world-class museums and gardens, and historic sites. Winterthur makes the perfect addition to countless itineraries. For a list of area attractions, fine lodging, and dining, click here.